Located high in Sri Lanka’s hill country, the city of Nuwara Eliya is surrounded by beautiful nature and countless tea plantations. The city, fondly referred to as Little England, has become an increasingly popular place to visit in recent years. 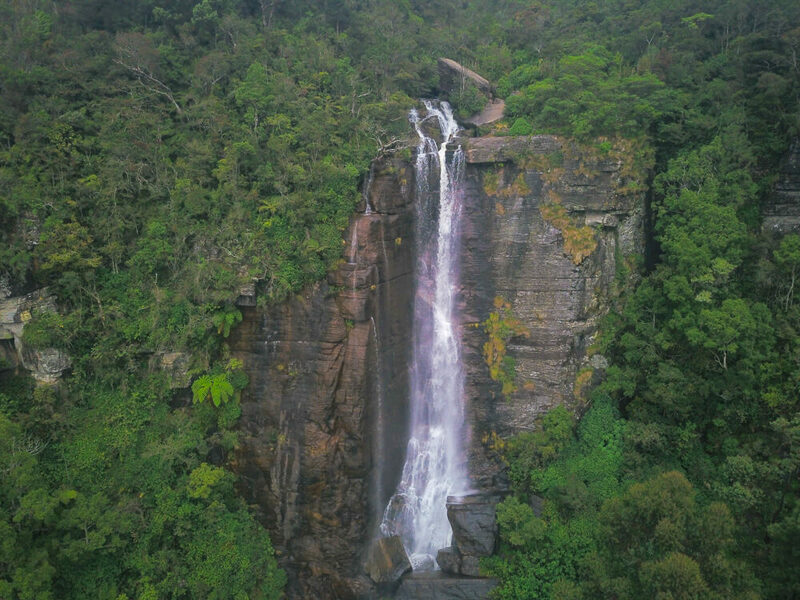 This is partly thanks to the numerous waterfalls found in the area, as well as the proximity to the impressive Horton Plains National Park. Having visited as part of our trip to Sri Lanka in December 2017, the Nuwara Eliya district was one our favourite spots in the country thanks to the many points of interest nearby. There are some beautiful hotels in this area of Sri Lanka, so click here to read our article on the best places to stay in Nuwara Eliya or head straight to Agoda for a number of excellent properties at great value. 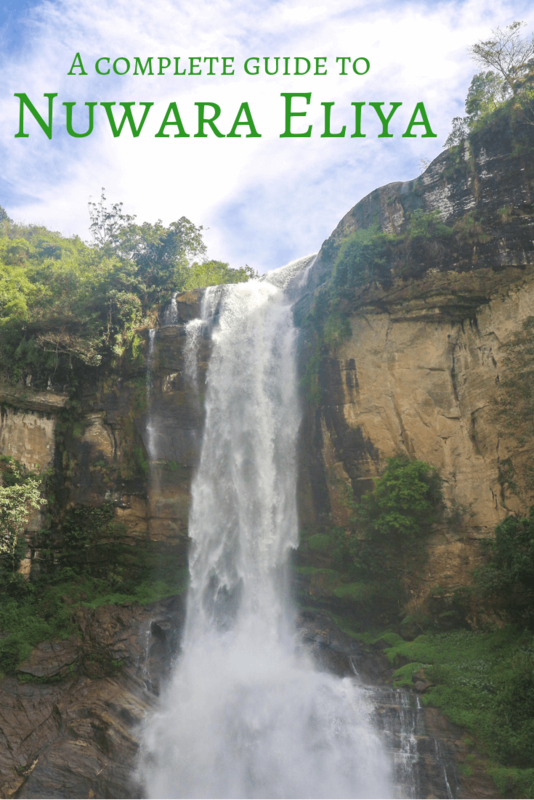 Otherwise, find out everything you need to know before you visit with this complete travel guide to Nuwara Eliya and these tips for travelling Sri Lanka. Make sure you’ve got everything you need for your trip to Nuwara Eliya with this guide of what to pack for Sri Lanka. 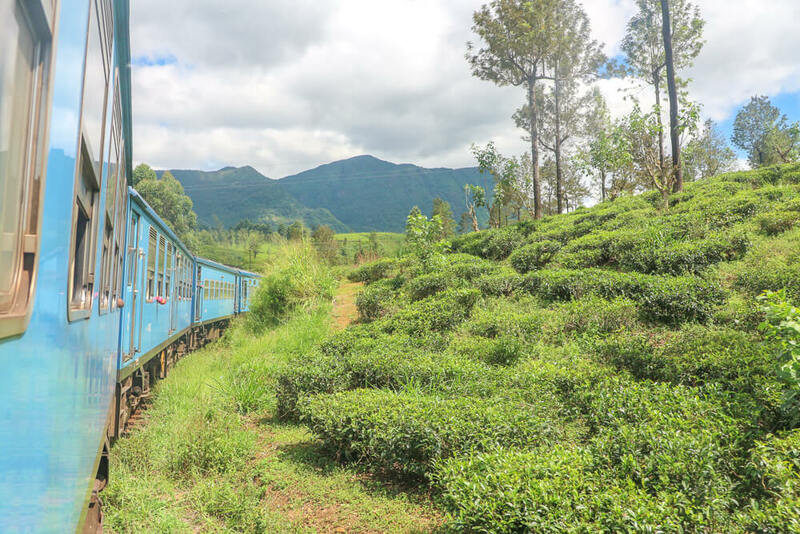 Train – Nuwara Eliya lies on the route between Kandy and Ella – which is considered to be one of the most beautiful train journeys in the world. This makes the train the obvious choice when deciding how to get there. You’ll have breath-taking views of Sri Lanka’s hill country and the tickets are extremely cheap – with prices starting at 60 rupees from Ella and 80 rupees from Kandy. The closest station to Nuwara Eliya is Nanu Oya. Once you arrive here you’ll be able to get a tuk tuk or taxi to your accommodation. When we arrived we were offered a lift for just 100 rupees each from someone who was on their way back to Nuwara Eliya in a minivan. This worked out at much better value than the tuk tuks, but if there’s no one about offering this then you should expect to pay around 500 rupees for a tuk tuk to the city. From Kandy the journey to Nanu Oya takes around 4 hours, whereas it’s just 2 and a half hours from Ella. Find out more about train journeys and other ways of getting around with our guide to public transport in Sri Lanka. Bus – Although we’d fully recommend the train ride, it’s also possible to get there by bus. Buses run from Colombo, Ella and Kandy to Nuwara Eliya multiple times a day. Travel times will vary depending on the weather and traffic but generally it takes around 6 hours from Colombo and 2 and a half hours from Ella and Kandy. Tuk tuks are the best way to get around Nuwara Eliya and the surrounding area. Once you find a driver you’ll be able to negotiate a price depending on what you want to visit. We rented a tuk tuk for the day to take us to Ramboda falls, lovers leap and Labookellie tea plantation/factory, which cost 3500 rupees in total. Prices will vary but be prepared to negotiate and never settle for the first price quoted to you! 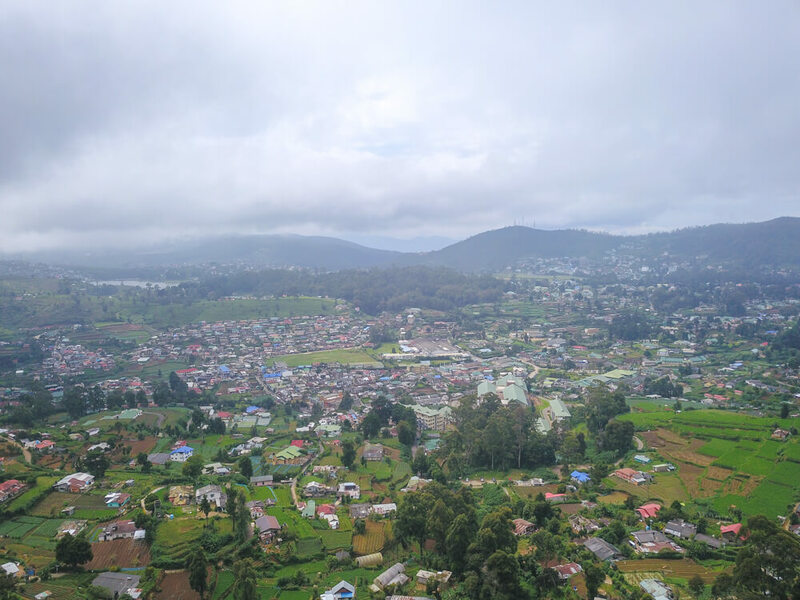 Nuwara Eliya has consistent rainfall throughout the year. 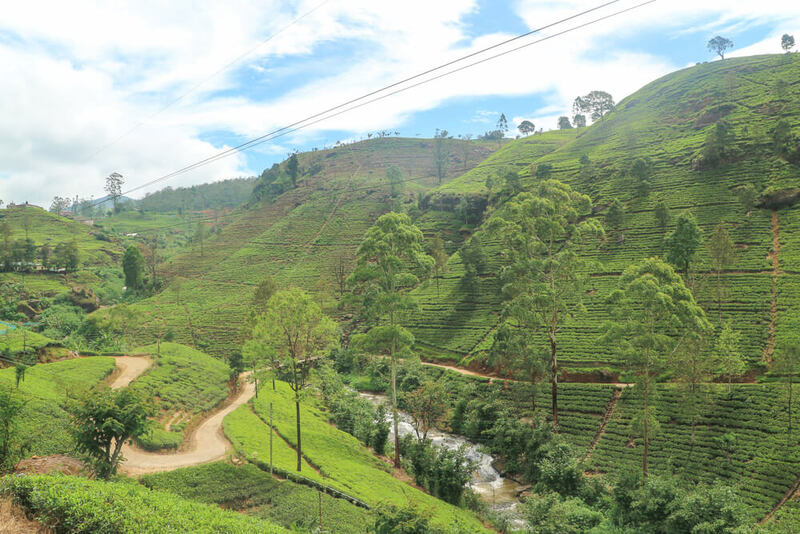 While this makes it a great area for tea plantations, it unfortunately means you’re likely to experience rain whenever you visit. The best months to visit Nuwara Eliya are February and March as this is the time of year with the least rainy weather. If possible, avoid visiting from October-December, as these are the rainiest months. It’s worth noting that nights are particularly cold between December and February. Your accommodation should provide enough blankets to keep you warm if you’re visiting at this time, but it’s worth checking they do provide this in advance. One month to avoid is April, as it can get very busy. Sri Lankans celebrate New Year during April, so prices increase in the area at this time. Horton Plains National Park – One of the top places to visit when in Nuwara Eliya is the Horton Plains National Park. The main attraction of the park is the World’s End viewpoint –a cliff with a sheer drop of 880 metres overlooking villages and tea plantations all the way to Sri Lanka’s coast. You’ll want to arrive at the cliff early though, as from around 9am mist obscures the view. The walk to the viewpoint from the park entrance takes around an hour and is part of a 9km circular track. Throughout the walk you’ll pass beautiful scenery and nature, with Sambar deer commonly spotted in the park. Continuing on from World’s End you’ll also pass the pleasant Baker falls, which makes for a nice spot to give your feet a rest. Entrance to the park costs around 4000 rupees (depending on your group size), but you’ll also need to pay for transport both ways. Unfortunately no public transport runs to Horton Plains from Nuwara Eliya, so your main option is to pay a driver to take you. A tuk tuk should cost around 3500 rupees, whereas a car will be around 4000 rupees. Your accommodation will be able to assist you in booking this if necessary. 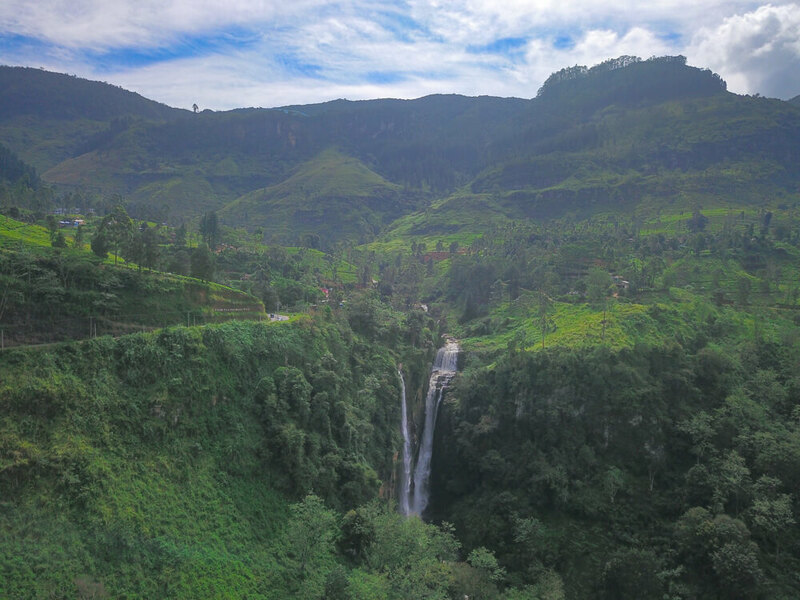 Lovers leap – This beautiful waterfall is found 2km from Nuwara Eliya city, and sits high in the hills overlooking the surrounding area. The easiest way to reach Lovers leap is to hire a tuk tuk and to walk the final section. A tuk tuk one way from the city should cost around 200 rupees. Alternatively you can walk from the city, however this can take around 1 and a half hours. Gregory Lake – A pleasant place to relax outside of the city. It’s possible to take part in various activities around the lake such as paddle boating, jet skiing and horse riding. Although entrance costs just 200 rupees, we’d recommend prioritising other spots unless you have spare time. Victoria Park – A private park with an abundance of colourful flowers. In particular the park is nice to visit from March-May and August-September as the flowers are in bloom. Entrance does cost 300 rupees, but it’s not much to pay for an enjoyable stroll around the bright gardens. Ramboda falls – Although it’s further from the city than Lovers leap, Ramboda falls is still well worth a visit. It’s a 20-minute steep walk to the waterfall, but this means it’s a lovely, secluded spot. Entrance is 50 rupees per person. On the way to Ramboda falls, there’s another waterfall that can be seen from the road. Although this isn’t possible to visit up close, you’re able to stop and take in the view! Hakgala botanical gardens – This colonial botanical garden is a popular spot to visit, just 16 kilometres away from Nuwara Eliya. It’s a lovely garden full of beautiful trees and colourful plant life, although the entrance fee of 1,500 rupees for foreigners is quite steep! 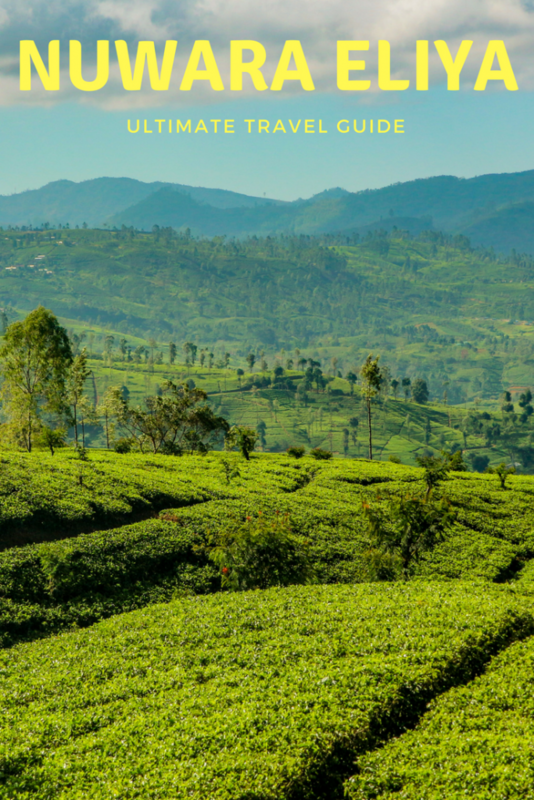 Tea plantations – Nuwara Eliya has a number of tea plantations; meaning large areas of countryside are covered with vast stretches of lush green tea plants. This alone is a beautiful thing to see and well worth getting out of the city to enjoy! For those wishing to see more, many tea factories offer tours so you can see how the tea is produced. Our tuk tuk driver recommended Mackwoods Labookellie as the best tea factory to visit. The tour was free and you also get a free cup of tea to enjoy at the end which is a nice bonus! If you do visit, we recommend sitting in the café’s outside section to enjoy views of the nearby plantations. De Silva Food Centre – If you’re looking for food on a budget then head to the De Silva Food Centre. You’ll find a range of Sri Lankan and Chinese food available at very reasonable prices. Milano Restaurant – Another budget option is Milano restaurant, which serves a mix of Sri Lankan, Chinese and Western meals. The service was quite slow during our visit but the food was good value for the price. Grand Indian – Although this Indian restaurant is one of the most popular places to eat in Nuwara Eliya town, the prices are higher than most alternatives. Despite the cost, the food is of a high standard – so if you’re willing to splash out for a good meal then this is the place for you! Grand Thai – Another of Nuwara Eliya’s most popular restaurants, serving a variety of tasty Thai dishes. It’s worth arriving early if you don’t want to wait for a seat at meal times! Like this Nuwara Eliya Guide? Pin it!